Jet is the logical progression from SubLOGIC's popular Flight Simulator software, which simulated a Cessna aircraft. This exciting simulation of the F-16 Falcon and the F-18 Hornet is SubLOGIC's answer to the many requests for a game with more action. 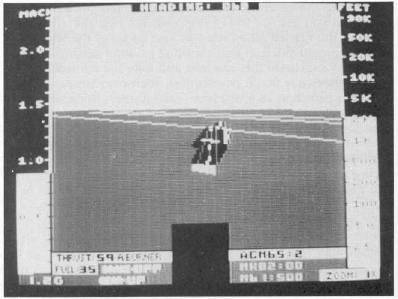 The flight characteristics of these aircraft were faithfully reproduced and, as such, Jet may require a little more time to master than other flight simulation programs. While it can be frustrating at first, with a little practice and some helpful hints, you'll be on your way to Ace status at mach speed. A common problem with first-time Jet pilots is they're too heavy with the controls. It's best to make changes a little at a time until you get the feel of the controls. You aircraft will not stop the maneuver as soon as you let go of the stick or neutralize your pitch, it will continue on for a second or two. You must anticipate this reaction and take the controls off early. Otherwise, you'll overcontrol, then overcompensate in the other direction as a reaction. Take it easy, think about what you want to do, and maintain a light touch on the stick. Trying to get the aircraft safely off of the carrier is one of the first problems players experience. Catapult launches can be tricky. The best way to master them is to establish a procedure and follow it every time you launch. The following procedure should get you safely into the air so you can get on to other things. Apply full power and afterburner. Press L to launch your aircraft. Carrier landings are difficult. You will have to practice the landings to master them. A few bits of information will make the process easier. When trying to line up for a landing, use the lines on the water to help position yourself while you're still a good distance away from the ship. These lines run perpendicular to the landing strip on the ship and represent one-mile intervals. So, if you're flying across these lines and headed towards the ship, you are close to being correctly lined up. If you are flying down or with the lines, you are flying across the ship's path and you aren't lined up correctly for a landing. Also, you can use the magnified views to see how well you are lined up when far away from the ship (remember to go back to 1X to help judge your landing). Don't make too big a deal about getting perfectly lined up either. You can hit the deck at any angle as long as you touch the white wire before you plunge off the deck or hit the tower. You don't even need to land from the right direction. You can come in on a heading of 270 and still land just fine. All you have to do is to land on the deck and then taxi over to the wire. That brings up another point: If you miss the wire when landing, all is not lost. If you keep your speed brake out and cut your power you can still land on the deck, turn your plane around, and taxi back to the wire. So if you miss the wire, you don't have to go around for another landing attempt like a real pilot would. Simply put the plane down and taxi back to the wire. The default weapons load for air-to-air missions is four Sparrows and four Sidewinders. Since you will probably fire several missiles before you start any heavy maneuvering, there is little harm in the extra weight of two more of each missile type. When the arming menu comes up, add two more Sparrows and two more Sidewinders. The often-seen three-against-one scenario and the lack of countermeasures equipment (such as flares and chaff) limit the amount of ACM (air combat maneuvering) possible. Most of your time is spent trying to outmaneuver enemy missiles. Some tactics will improve your chances of making kills and surviving the fight. Theoretically, you should be able to get off the first shot. Your AIM-7 Sparrow missiles have more than twice the range of a AA-2 Atoll. 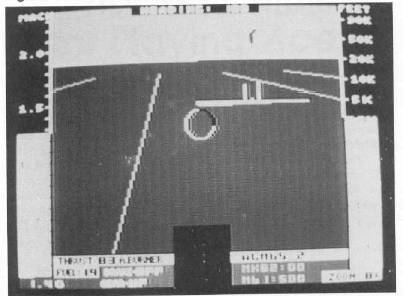 But the game designers took away this advantage and programmed the Atoll with the longer range, so the MiGs will always shoot first. You aren't limited to the range indicator. You may fire and score hits on targets before the indicator turns black. A good tactical plan when outnumbered is firing a salvo of four Sparrows before your indicator turns black. Then begin your evasive maneuvers to avoid the incoming missiles. 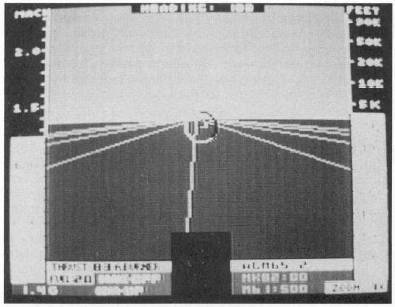 During your evasive maneuvering you should arm your AIM-9 Sidewinders for an opportunistic short range shot that may present itself. Defensive maneuvering is very important in this game since you aren't equipped with flares or chaff. 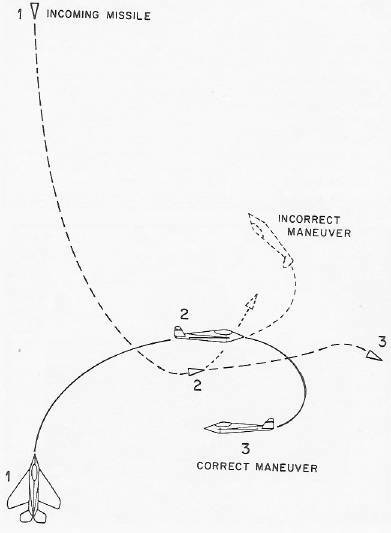 Successful maneuvering is usually divided into two segments. The first part of the maneuver involves flying at a right angle to the incoming missiles. This will usually cause them to fly behind you and then turn towards you. Once this happens, the second phase begins. At this point you should turn hard toward the missiles and start a spiraling climb that forces the missiles to constantly change direction and climb, thereby using their fuel. You must turn towards the missiles, not away from them. Turning away would only give them a better position behind you. You can mix a series of loops with the climbing turns, which may also cause the missiles to miss. Use of your afterburners should be limited during defensive maneuvering because the added heat will only provide a stronger signal to the enemy heat-seeking Atoll missiles. If you are hit, you can still attempt revenge. You will have several seconds of spinning before your plane breaks up. Take this time to arm and shoot all of your Sidewinder missiles if the enemy is close, or Sparrows if he is further away. When you "punch out," your missiles may still have time to find their mark and score another kill for you. Take care not to hang around in the cockpit too long. If you're still inside when the plane breaks up, you will lose your opportunity to use the rest of your allotted aircraft. The dive bombing technique seems to be the best technique in Jet. Though it does place you in a position to be fired at occasionally, you will score more hits than trying to pop up from a low level. The additional speed and energy picked up during your dive can be used to outmaneuver any missiles that may be fired at you. When first learning to dive-bomb, you should follow the procedure outlined below. As your skill improves, you can attempt to drop bombs from lower altitudes, or from farther away, to reduce your exposure. Launch, maintain your heading, and climb to 5000 feet. Make sure your view is set for 1 or 2 x . Once you reach 5000 feet, start a turn to your right; continue to climb. A target should come into view shortly. Stop your climb at 10,000 feet and line the target up directly in front of you. Maintain level flight; cut your afterburners. Watch your radar screen. When the target is halfway between you and the edge of the screen, start your dive. Center the target in the middle of the range circle. Now set your view to 8 x and make any small adjustments to center the target. When on 8 x view, make very small course corrections because any small change you make will cause a large change on the screen. Drop your weapon as you pass through 5000 feet. Pull up, turn away from the target, and go back to 2 x or 1 x for maneuvering. If you're fired on, Start a hard spiral climb. At position 1, you encounter an incoming missile. Turn to take a path at a right angle to the missile's path. This will generally cause the missile to pass behind you. At position 2, the missile is behind you. Break hard in the direction of the missile. Once again the missile should be forced to change directions and miss behind you. At position 3 start climbing turns. Turning away from the missile at position 2 (doffed lines) will only give the missile a better shot at you. It's very important that you learn to use the magnified view option when aiming air-to-ground weapons. If you're on 2 x, you may think the target is perfectly lined up, but by going to 8 x you'll often find that the target isn't in the center of the circle and further minor adjustments are necessary. Also, you should take care when maneuvering at high magnification levels. These levels will severely limit your field of vision and give you a distorted picture of what is happening; a shallow dive will look very steep at 8 x . Jet is compatible with the series of scenery disks offered by SubLOGIC. While you cannot use these disks for combat missions, they could be used to stage aerobatic routines at one of hundreds of airports across the country. With the San Francisco disk you could perform a show over the Golden Gate Bridge and Alcatraz Island. These disks have one additional benefit: The fuel gauge will not work. You can fly for an unlimited period of time. While this might not be realistic, it can be a lot of fun as you cross the country, going from disk to disk in record time.